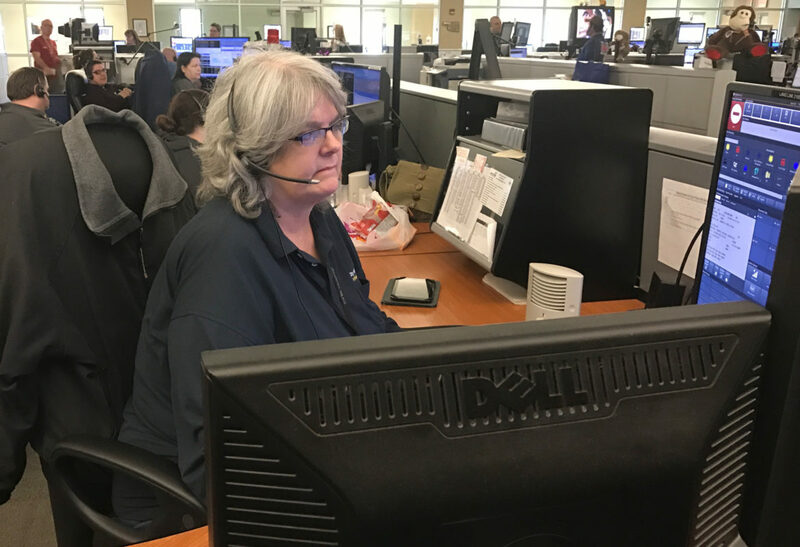 Donna Rutherford takes calls at Tulsa’s 911 Center and dispatches responses. Over the past 3½ years, Tulsa residents and businesses have paid more than $1 million in fees to a voluntary city program to ensure that police will be the first to respond to an intruder alarm on their property. But because of a technical issue with the city’s 911 dispatch system, those who paid into the program have been receiving the same level of service as those who didn’t pay, an Oklahoma Watch investigation has found. That means the 911 system has unnecessarily dispatched officers thousands of times to Tulsa homes and businesses, since only a tiny fraction of intruder-alarm calls involve an actual crime, the Tulsa Police Department says. The reason for the inefficiency has to do with incompatible computer systems. When an intruder alarm at a home or business is triggered, the alarm company checks with the owner to see if it’s a false alarm. If necessary, the alarm company then contacts the police. Under the city’s First Response Certificate program, individuals and businesses pay an annual fee to guarantee that police will respond to their intruder alarm calls. For everyone else, police are considered “secondary responders” who will only investigate if there is evidence of a crime. However, the city’s dispatch system and its database of alarm certificate holders do not interface well with each other, which means the default response is to send police to every intruder alarm call. Karen Gilbert, chairwoman of the City Council since December 2013, said while the council was familiar with similar problems with the fire dispatch system, she was unaware that those problems extended to the alarm certificate database and police response system. “No one has said anything to us about it,” she said. In 2011, Emergency Medical Services Authority, which oversees ambulance services, purchased a computer-aided dispatch system from California-based TriTech Software Systems. The city of Tulsa had the same systems installed two years later for $2 million. Problems with EMSA’s system quickly became apparent. Dropped calls, system crashes and other technical problems plagued the new system, which did not interface properly with the city’s existing fire dispatch system, the Tulsa World reported. Issues with the city’s 911 dispatch also became apparent. Since the TriTech system was first installed, employees taking 911 calls have been unable to see whether addresses have alarm certificates associated with them, said Terry O’Malley, director of the Tulsa Police Department’s 911 public safety division. The city tried to bring the systems together but has not been able to come up with a workable solution, O’Malley said. Michael Dellinger, the city’s chief information officer, said the sticking point for the two systems is was the addresses that have multiple sub-addresses, such as malls and apartment buildings. Of the 29,211 intruder-alarm calls that led to a dispatch of police last year, only 115, or less than 1 percent, were confirmed to involve an actual crime, according to an analysis by the Tulsa Police Department after inquiries by Oklahoma Watch. Sixty-eight percent were confirmed false alarms, 21 percent had an unknown disposition and 10 percent were canceled before officers arrived, the analysis found. False alarms are often accidentally triggered by the system owner or by weather or animals, O’Malley said. More than 20,000 man-hours were spent in 2016 responding to alarm calls, the police department estimates. The First Response Certificate program is only for burglar and intrusion alarms, not for other alarm systems, such as hold-up or fire alarms, O’Malley said. In 2016, there were 8,082 residential alarm certificates and 1,888 commercial alarm certificates, the city’s finance division reported. O’Malley and Dellinger said the best current fix involves dispatchers opening a separate browser window, going to a web page with the city alarm certificate database, running the address of an alarm call through the database, and finding the address or a similar-looking address to determine whether it has a certificate. It takes 911 personnel 30 to 90 seconds per call to check addresses this way, making the method impractical, O’Malley said. In 2016 alone, 911 personnel received nearly 36,000 intrusion alarm calls, more than any other type of categorized call, 911 Center data shows. However, O’Malley and Dellinger said they are hopeful that the system will be fixed by July, when the city upgrades to a newer version of the TriTech system. That update might allow call takers and dispatchers to see the city’s alarm certificate data, although there are no guarantees because the repair hasn’t been tried elsewhere, O’Malley said. In 2000, the city stopped fining individuals for false alarm calls and instead came up with the voluntary certificate system. Changes in 2014 required that certificates be revoked after two false alarms in a year. Statistics from the city show the city revoked no certificates in 2016 for false alarms. In June 2014, faced with steep budget cuts, the City Council increased annual alarm fees from $30 to $35 for residences and $30 to $75 for commercial properties. At the time, estimates provided to the council by the city’s finance office projected that the city would generate about $1.2 million a year in revenue with the increase. Subsequent comprehensive financial reports show that the alarm fees generated less than $900,000 a year. Yet Donna Gemmill, license and revenue processing manager for the city, told Oklahoma Watch that in 2016, there were nearly 10,000 new or renewed first-response certificates issued to residences and businesses, generating about $424,000 in revenue. Gemmill said she didn’t know why the numbers in the financial reports differed from her figures, but other types of alarm fees may have been included in the calculations.